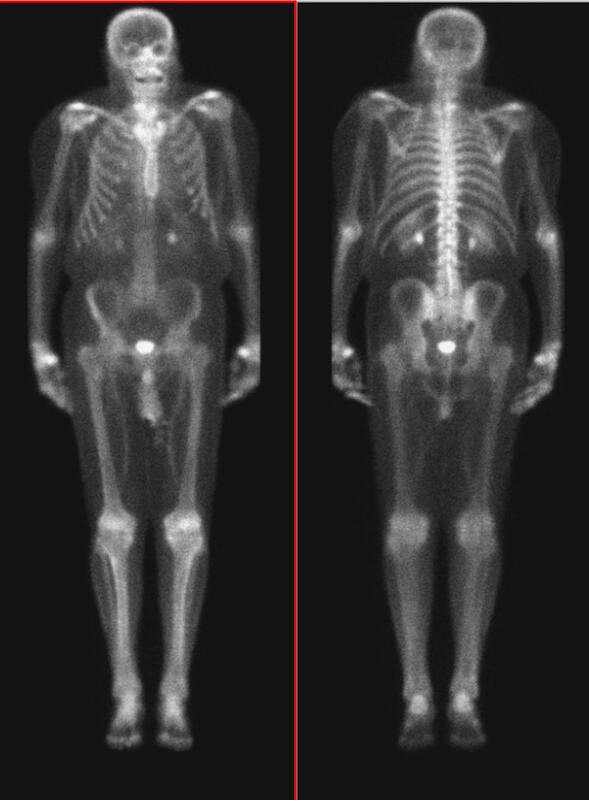 Bone scintigraphy is an important modality for examination of skeletal pathology. Non-osseous structures normally seen on bone scintigrams are kidneys and bladder, as technetium 99m diphosphonates are excreted primarily via the urinary tract. Although it is used occasionally for the evaluation of extra-skeletal abnormalities such as myositis ossificans, electrical burns, polymyositis and dermatomyositis, in most cases important information regarding the soft tissues are an incidental finding. The mechanisms of uptake in extra-skeletal are similar to those for bones. Calcium and phosphate are deposited when there is an excess of tissue calcium, following local tissue necrosis or damage, or when the calcium phosphate product is elevated such as in primary or secondary hyperparathyroidism. Other mechanisms suggested to explain uptake in tissues other than bone include hyperemia, altered capillary permeability, presence of iron deposits, adsorption onto immature collagen, binding to denatured proteins or enzyme receptors.